Does my child need to wear performance makeup? Performance makeup is necessary for professional dancers, but not essential for children. At FVAD, we strongly believe that children should be children as long as possible. We believe that children are already beautiful, so why cover their faces with makeup? Students in our performances shine on stage because they are happy, healthy and well-trained. 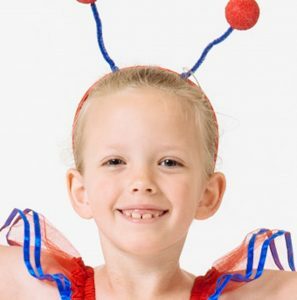 They wear age-appropriate costumes, and dance age-appropriate steps to age-appropriate music. Our Primary School students do not wear makeup. Our Junior School students are not required to wear makeup, but may optionally wear minimal, light makeup. Our Senior School students optionally wear stage makeup. Makeup is optional in the Junior and Senior Schools for our performances. When worn, it is worn lightly. The decision to allow a child to wear makeup in the Junior & Senior Schools is left to our parents to decide within their family. While makeup can be fun, it can also be damaging. There are so many toxic chemicals and other unhealthy substances in so many hair and body products today, that it’s important to limit exposure to these items. If families do decide to allow their children to wear makeup, consider organic or natural products whenever possible so that exposure to toxins is kept to a minimum. The same suggestion applies to all hair and body products.